I posted a horrifying story last week about a Lithuanian immigrant who was mooching off British taxpayers. She basically had a very comfortable life thanks to beleaguered taxpayers, and I compared her to a Greek woman who thought the state owed her everything. But there’s no ethnic requirement to be a bum. I’ve also shared stories about American moochers and Austrian moochers. I’ve even shared stories about terrorists getting welfare handouts in Australia and France! Here are some odious details from the UK-based Sun. The couple, who have a four-month-old daughter Tullulah-Rose, say they can’t go out to work as they could not survive on less than their £1,473-a-month benefits. The pair left school with no qualifications, and say there is no point looking for jobs because they will never be able to earn as much as they get in handouts. 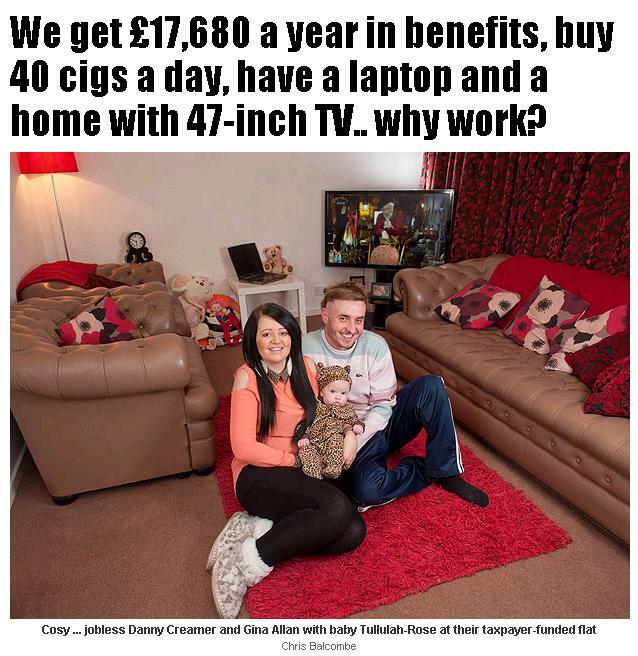 Gina admits: “We could easily get a job but why would we want to work — we would be worse off.” Danny’s father, 46, even offered him a job with his bowling alley servicing company — but could not pay him enough. So how much are these moochers stealing from taxpayers? Quite a lot, particularly if you keep in mind that £1 is equal to $1.57. Gee, isn’t that nice. Taxpayers are even financing their cigarettes. Am I being overly dramatic? Perhaps, but is there any other reaction when the government persecutes a family with possible jail time for rescuing Bambi? Here are some absurd and disturbing details from the Indianapolis Star. 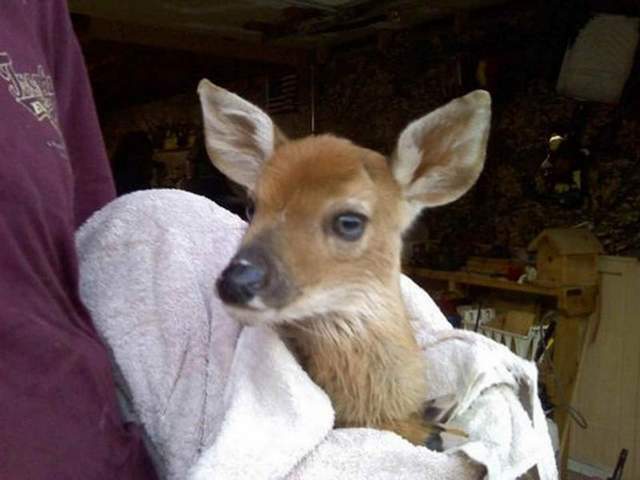 When Connersville police officer Jeff Counceller first encountered the baby deer, she was curled up in the corner of a front porch.It was clear the fawn was injured. Counceller could see the wounds… If left to its own, the animal would surely die… So the Councellers took in the deer, which they named Dani, cleaned and dressed its wounds and nursed it back to health, all with the intention of turning it out into the wild once it was big enough and strong enough to have a chance on its own. …she was unable to stand, and her maggot-infested wound was ugly. The Councellers contacted DNR at the time but were told to return the deer to the wild and let nature take its course. “It would have been a death sentence,” Jeff said. So the family did what any decent people would do. They nursed the deer back to health. But decency and government often are in conflict. Trouble is, what the Councellers did is against the law. Now, more than two years after rescuing the deer, more than six months after conservation officers began an investigation, the Indiana Department of Natural Resources wants them prosecuted. …DNR officials began an investigation that entailed half a dozen visits to their home and numerous calls to local authorities. In July, the agency issued an eight-page report and asked for a special prosecutor from another county to handle the case. Why the charges are being sought now — six months later — isn’t clear. I think the answer is obvious. The bureaucrats from the Department of Natural Resources are sulking because their imperious demands weren’t obeyed. So they’re lashing out at an innocent family, as indicated by the following excerpts. …when the DNR came calling, the Councellers say they were almost ready to release Dani back into the woods. They were just waiting for the summer drought to pass and the nearby corn crops to mature enough to offer cover and food for Dani. They say they weren’t aware it was illegal to keep the deer. That’s when the bureaucratic nightmare began. When the DNR began its investigation, the Councellers say the conservation officer suggested they obtain a rescue permit. But that was denied. Soon, the DNR said the deer must be euthanized, that it was a safety threat to humans. Fortunately, an unknown good Samaritan intervened and freed Dani before the government could kill the helpless animal. But on the day of Dani’s scheduled execution, the deer turned up missing, its enclosure left open. The Councellers say they didn’t arrange the escape or know how the deer was freed but acknowledge that they didn’t probe too deeply to find out. But no good deed goes unpunished when spiteful bureaucrats are involved. …there was nothing but silence from the DNR until the Councellers received notice of the charges earlier this month. They plan to fight the case, even though jail is unlikely and the lawyer costs — which could reach $5,000 — are significantly higher than a likely fine. It’s a matter of principle, they say. They don’t want to plead guilty for trying to help an animal and when they had no criminal intent. Not surprisingly, the rest of the community is on the side of the deer (and the persecuted family). Indeed, there’s even a Facebook page for folks who want to register their displeasure with this example of government thuggery. All things considered, this story from Indiana shouldn’t be part of the government stupidity and incompetence contest. Given the venality of the bureaucrats, it belongs with this list of horrifying examples of government thuggery. A women jailed overnight because she let her kids play outside. Cops legally stole $17,000 from a man who committed no crime. Threatening to send a woman to jail because someone whistled at a whale. The government treating child molesters more leniently than people who accidentally omit irrelevant info from forms. In a just world, a court will immediately dismiss the charges against the Counceller family. I would urge that the family then be awarded damages, but that’s not the right response. The bureaucrats would merely shrug and let taxpayers pick up the cost. The only good outcome is to unceremoniously fire every bureaucrat who played a role in this outrageous episode. Like most bureaucrats, I suspect the pinheads at the Indiana Department of Natural Resources are overpaid. So losing their pampered positions would be genuine punishment and it would send a message to the rest of the paper pushers not to harass innocent and good people.